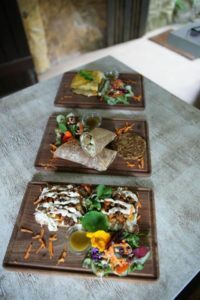 Conscious Café is a Vegetarian and Vegan café that serves freshly squeezed juices, smoothies, fair-trade coffee and teas, as well as wraps, sandwiches and salads. Our wraps are made daily in-house, our bread freshly baked with a live culture yeast and our sauces, dips and dressings made from scratch. 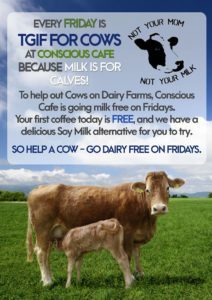 It is with this motto in mind that Conscious Café involves itself with activities such as ocean conservation and Animal Rights activism. Our owner Andre is a ship’s Captain for renowned Ocean Conservation group Sea Shepherd and has been on several campaigns around the world, stopping illegal fishing and capturing evidence of destructive fishing industries. The Conscious Crew has also been involved in other community projects, such as beach-clean ups, Human Rights marches surrounding pollution and clean air, as well as several animal rights activities. 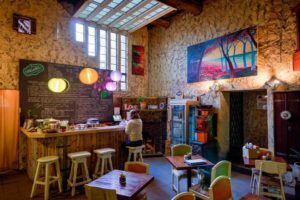 The Café hosts evening concerts with local and international artists, as well as film evenings, Chanting groups, Drum Circles and more! We have an ever changing exciting line-up of events and plans, and take great pride in bringing our community something different and unique each month.